Consolidated Bank Notes (CBN) Valuations. In this section on Ploughman note values are listed approximate valuations in Euro for all the signature varieties of the Ploughman notes in the commonly used grading increments. Ploughman £1 and £5 notes are not rare. Generally examples of these notes are easily obtained in Fine-VF for the more common banks. £10 notes are a bit scarcer, but still turn up regularly in auctions. Poor — A badly damaged note, but still more or less intact. EF — Extra Fine, also called Extremely Fine. UNC — Uncirculated. Ploughman notes in this grade are rare. 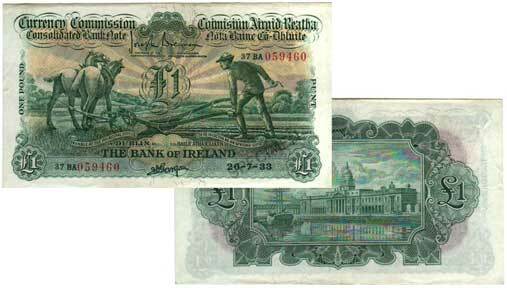 There is a section on irishpapermoney.com which covers grading of banknotes, illustrating examples of each of the grades. The main advice for collectors is to learn how to grade a note, and in particular to learn how to spot washed and cleaned notes, or repaired notes. Alterations reduce the grade of a banknote.